try to make bigger pieces. Little did I know that while the chemicals are the same, the process for larger pieces is very different. Many unforeseen issues arose, along with a few failures that followed. I developed a process that allows me to make these unique pieces. In its simplest terms, the piece of wood or burl is pre-turned to roughly its final outer shape, formed, and then cast under pressure with clear polyurethane resin mixed with pigments. The acorn cap pieces have a plug or inner form that is turned, the outer form is fabricated, and then the acorn caps arranged and cast under pressure. While there is no precise control over the swirls of the pigments, you do come to understand how the form and pouring of the resin affects the final outcome. It does become somewhat predictable with experience. Of course, there is much more to the process, but this explains the basic concept. My work is inspired by my environment. When I see a shape that I like, I make a mental note to use that shape in a piece. I like to give my pieces rather simple forms, as I do not want to detract from the visual textures that the mixed media provides. The effects are stunning and the possibilities limitless. I get new ideas for future work every day, and what I enjoy most is that others appreciate the pieces I create. 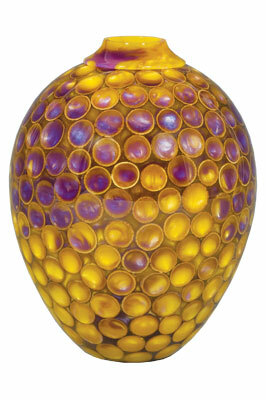 The piece featured here is called 'Purple Haze' because of the colouration patterns. This is a smaller piece but was made with the smallest acorn caps that I have ever found. Some were smaller than a #2 pencil eraser and most were about 6-10mm in diameter. These were selected for this piece as I felt it would give much better density which would add to the visual texture of the piece. This was my first use of this colour combination. Yellow and purple are complementary colours but are not used together all that much and I thought it would be a fun combination. The dimensions of this form are 120mm high by about 90mm in diameter.